Manufacturer: Hawker was designated to work on the land-based version, and responsibility for the naval conversion was assigned to Boulton-Paul Aircraft Ltd. of Wolverhampton. Battle Honours: 1939-1945 war: None in this conflict as the aircraft was only produced after then end of hostilities. Post-war it had significant involvement in the Korean war. Paired with the Fairey Firefly, it provided the “heavy attack” element for the Royal Navy carriers that served in the Korean War. Sea Furies were used extensively throughout the Korean war, mainly in the ground attack role (with Fireflies), flying from HMS Glory, HMS Ocean, HMS Theseus and the Australian carrier HMAS Sydney. 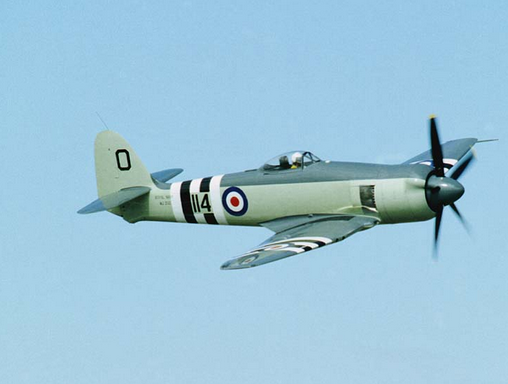 Even in the Korean war the Sea Fury was one of the best of it’s type, showing itself on many occasions to be superior to the more up-to-date enemy jets of the Korean conflict. Fleet Air Arm Hawker Seafury y F.B. 11 O-114 of 802 squadron (HMS Ocean) flown by Lt P “Hoagy” Carmichael on 9 August 1952 shot down a MiG-15 was the first such kill by a piston-engine fighter, and the only kill by a British pilot flying a British aircraft during the Korean War.